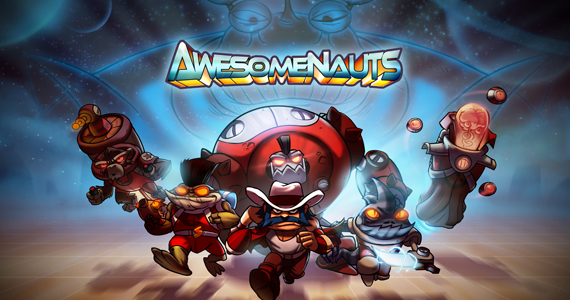 The Indie studio Ronimo Games (formerly Banana Games) announced their arcade side-scrolling beat-em-up title Awesomenauts back at E3 2011, and the team’s latest creation was met with favorable reception. Launching on the digital marketplace via the Xbox Live Arcade and PlayStation Network, Awesomenauts brings a considerable slice of unique and hilarious gameplay for players of all ages to enjoy. The newest of the Awesomenaut Showcase trailers gives players an exclusive look at Leon Chameleon, an anthropomorphic one-armed chameleon bandit who joins the ranks of the Awesomenauts as a mercenary to escape capture. 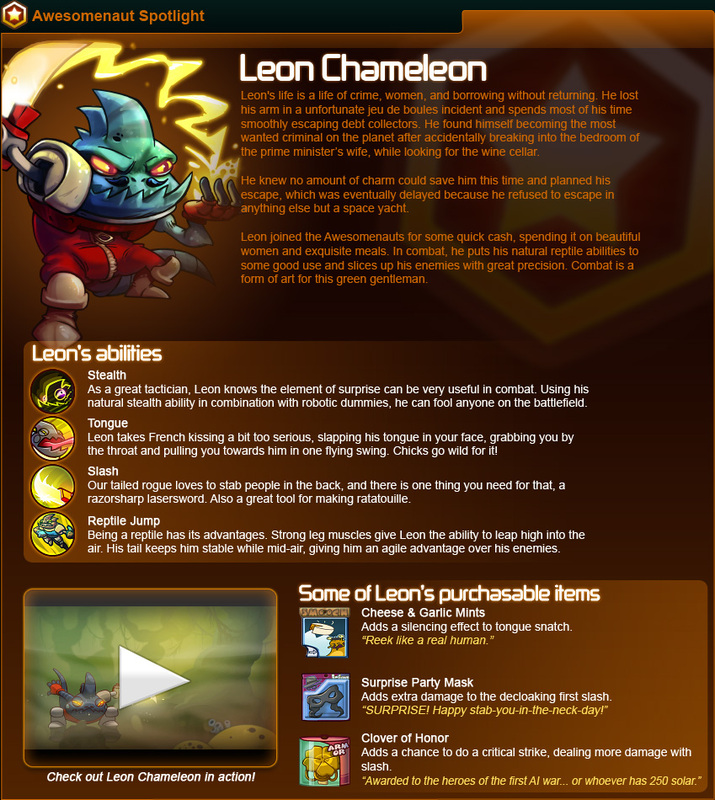 Leon Chameleon also happens to be the most wanted criminal on the entire planet. Also, Leon is fluent in French–imagine that! Check below on a character profile of this reptilian renegade, the official reveal trailer for the lethal lizard himself, and an introduction to what players can expect from Awesomenauts. Along with the two previously revealed awesome heroes–Froggy G and Sherriff Lonestar–Leon the French-speaking-Chameleon was the winner in a Facebook poll in which users voted for which Awesomenaut would be showcased next. For the first time in galactic history, Awesomenauts will bring the popular MOBA genre to the 2D plane with rich, detailed environments. Adrenaline-pumping action with up to 3 players staining your couch, or 6 players online. A roster of unique playable mercenaries, each featuring their own set of skills and upgrades. Unlock over 100 unique items to beef up your abilities and customize your personal playing style for each match. Face-melting battles across multiple exotic planets and alien spaceships. Awesomenauts is inspired by classic, Saturday-morning cartoons from the 80’s, and features a soundtrack that is sure to stick in your head for days. The year is 3587, conflict spans the stars. Huge robot armies are locked in an enduring stalemate. At the center is a team of elite mercenaries fighting for the spoils of war: The Awesomenauts. Combining the gameplay of classic 2D-platformer titles with that of modern, fast-paced MOBA-games, Awesomenauts allows up to six players to battle against one-another across multiple alien worlds. Featuring a playable roster of unique heroes, Awesomenauts brings ferocious team play and angry, light saber-wielding aliens together. Who’s your Awesomenaut? Find out when Awesomenauts is released on the PlayStation Network and the Xbox Live Arcade Marketplace later this year. For more information on Awesomenauts please visit the official website.